As you can see, today was "meat day" as far as the sales. 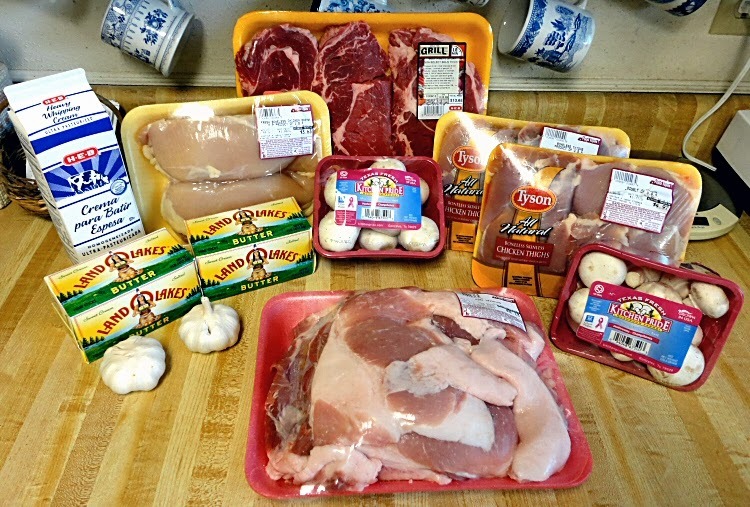 Food Town had sales on boneless chicken thighs ($1.77lb), boneless breasts ($1.88lb) and they had pork trimmings for 69-cents per pound. Today I'm making Pork & Mushroom Stir-Fry and I wanted a little more fatty meat to add to what I already had in the freezer from the last time I bought trimmings. I've got the larger pieces of fat roasting in the oven to make into cracklings for snacking. I don't know if it was a good price but I needed to stock up on garlic anyway. I paid 81-cents for both heads. The 8-ounce containers of mushrooms were on sale for only 89-cents each. Those are both going into my pork dish. HEB had Land O Lakes butter for $2.00 with a store coupon so I bought two pounds. They also have ribeye steaks on sale for $3.97 pound so I splurged on a package of three huge steaks. The heavy cream was the usual $3.56. No luck today but I'm still keeping an eye out for a sale on eggplant so that I can make Eggplant Lasagna. They did have a pretty good supply of it for change though. I don't know when eggplant season is but I suspect it might be in the fall. They were selling them by the pound today and they would have cost a fortune at $1.79lb. When they have them on sale, they're usually 2/$1.00. Tomorrow is our 31st wedding anniversary and we're planning to go out to eat somewhere. I'm not sure where yet but I've got a couple of ideas. I always enjoy the fajitas at Chili's but I was thinking of trying P.F. Chang's. I've never been there and hopefully they've got something that's not too outrageously carby if I omit the rice/noodles. I know that they're loaded with sugar but I'd really like to try their Chicken Lettuce Wraps, minus the rice sticks, and the Kung Pao Chicken sounds good. Can anyone recommend some good options to try there? Linda, have you ever used your pork rind pizza crust to make garlic bread or bread sticks? I'm in love. I don't think that I have tried that. How do you make yours? I have done them a few ways but my favorite is to make the crust thicker... Like half an inch. I cook it longer. When done I had mozzarella to the top and garlic power. Amazing. I'm on this! Thanks Linda & Tina~!! 2. I will add cinnamon and splenda (or swerve maybe) and omit the garlic. Can you imagine if this is as amazing as it sounds? Both ideas sound very interesting, Tina. Please let us know how they turn out. Yes, I'm very lucky. Food Town sells all kinds of unusual cuts of meat, including assorted organ meats and other animal parts. I've even seen pork skins there that I assume could be made into fresh pork rinds. I read somewhere that you have to boil the skins first and then deep fry them in hot oil or something like that.